The word Futura, by the meaning of “Future”, suggests it’s the future of our Micromouse program. 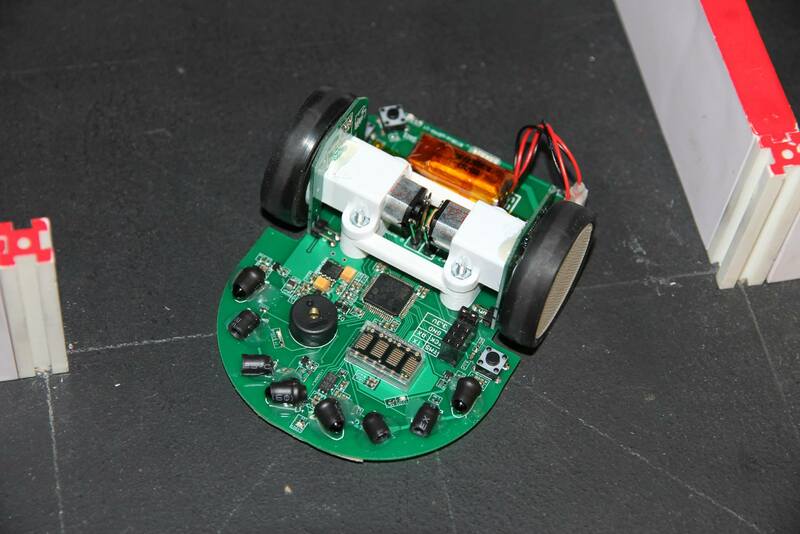 I established this program funded by UCLA IEEE this year, by offering returning members or experience IEEE Micromouse members with a pre-made high performance low cost Kit Mouse, to teach them all concepts in a reversed order: first software than hardware, to guarentee they will be able to apply the knowledge to the robot immediately after lecture, without waiting for their own hardware to build. They will be more confident to make their own hardware afterwards and less efforts will be taken for code migrating. Thanks for the help from David Wang and Jeremy Haugen to help me finishing assembling all kit mice over Winter break and giving some of the lectures. Each kit only costs $150 including 3 sets of batteries(6 x 3.7V 120mah 25C lipo to make 3 sets), 2 lipo chargers, one FTDI board one ST-Link V2 programmer and one bluetooth adaptor for debugging. However, they must design their own Hardware for any competition, and we will take Kitmouse back for other people to use for next year.